Count on the Ivy Tote by Mona B. for style, comfort, and functionality. This roomy tote is constructed of upcycled neutral stone canvas with genuine leather handles and accents. 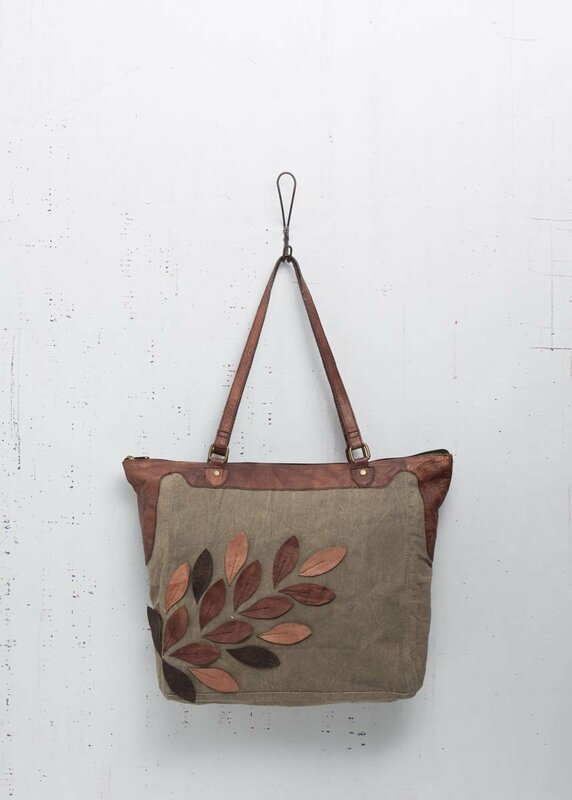 A beautiful design of leather leaves in multiple shades of brown is stitched across the front of the tote. Double leather handles have 10" drop. Zipper closure. The interior is lined with the signature Mona B. cotton lining, and contains a large zipped pocket, 2 open pockets, and plenty of room for your belongings. Dimensions: 18""W x 14"H x 4"D. Made from up-cycled canvas. The fabric shows the history of its travels which may include stitch marks, minor staining and unique scars and bruises. Color variations and patches add to the uniqueness of each bag. Heavy cotton canvas and genuine leather.